The burgundy hues of the feathery inflorescences combine superbly with the rich reds and greens of this cultivar’s elegant bunches of foliage. 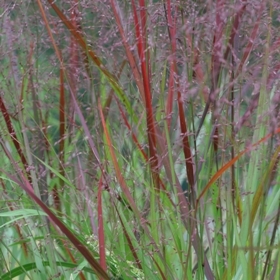 The warm tones of the Panicum beautifully complement those of the adjacent Miscanthus sinensis ‘Sirene’ and Echinacea purpurea here in the botanic garden. Native to the Americas, this perennial grass will happily grow in a range of soils, tolerating periodic flooding, and even drought conditions once established. Recent US research has shown that this fast-growing species can be grown as an effective biomass crop, delivering vast savings of carbon dioxide emissions compared with petrol – an important discovery considering the mounting threat of climate change.